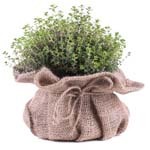 Thyme is a small evergreen shrub and member of the mint family. Native to the western Mediterranean, thyme has been utilized since ancient times for its culinary, aromatic, and medicinal properties. In ancient Greece, thyme was burned as incense during sacred ceremonies and was considered to be a symbol of courage and admiration. Ancient Egyptians valued thyme as an embalming agent used during the mummification process. During the Middle Ages, women presented knights a scarf with a sprig of thyme tied to it over an embroidered bee. In the 16th century, thyme oil was used for cleansing and as a mouthwash due to its antibacterial properties. Today, thyme is a staple in many cuisines around the world. Thyme also contains a variety of flavanoids including apigenin, naringenin, luteolin, and thrymonin, which increase thyme's antioxidant capacity. Thyme's flavor compliments hearty legumes such as kidney beans, pinto beans, and black beans. Another excellent pairing with thyme is fish. Try topping grilled or baked fish with a thyme and rosemary pesto, with the option to add pine nuts or walnuts. Also, try placing a minimum of five sprigs of thyme on poached fish to add flavor. Infuse your favorite olive oil with a few sprigs of thyme and use it as a dipping oil or even in cooking.